One of our good friends, my husband's golf buddy, is having a birthday this week and is also preparing for a major European holiday. So I decided to include a Mediterranean element in his birthday card! I added a drop of Smoky Slate ink to some embossing paste and made the background with some Basic Gray cardstock and one of the Pattern Party masks. 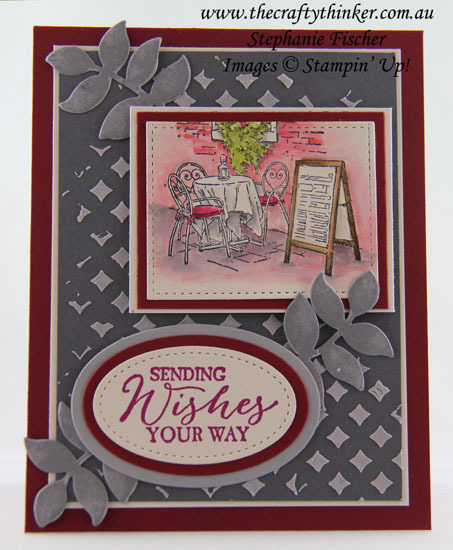 The image from Mediterranean Moments was stamped with Basic Black ink and watercoloured before I cut it out with one of the Stitched Shapes framelits and layered it onto Cherry Cobbler and Very Vanilla panels. 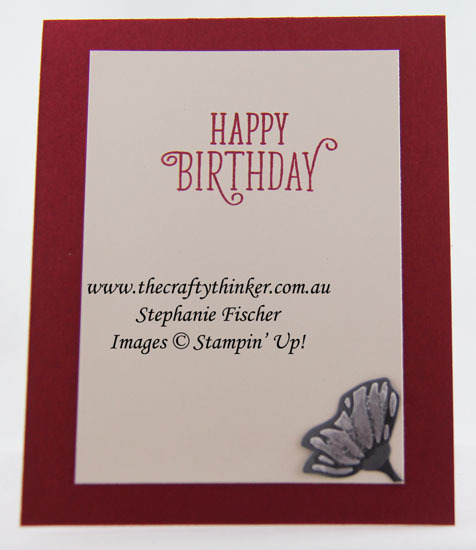 The greeting is from Butterfly Basics . The foliage was left over from another card and found its home here! I stamped the image from Oh So Eclectic in Basic Gray ink onto Smoky Slate cardstock and cut them out with the matching die in the Eclectic Layers Thinlits (buy as a bundle to save 10%). The flower in the corner inside the card was also left over from another card!